Missing Beta 1.7 Terrain Generation? No incentives to explore anymore? 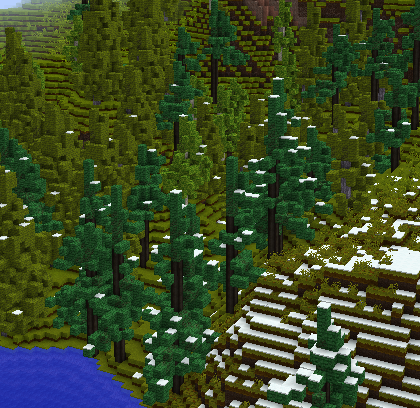 All the new biomes kinda look the same? No more rare items anymore? VintageCraft aims to remedy all of that! The plan is to produce a full conversion mod similar to TerraFirmaCraft, but not as survivalistic. This mod requires an update. I have a small question, how do you make a furnace like the one in the mechanical milestone 4 video? I have tried everything I can think of and checked literally all of your videos related to vintagecraft and not one shows or tells how to make that furnace. I don't know how I managed to miss that, thank you! Welcome! The wiki now also has the video tutorial i promised to do! Is this a mod incompatibility? I made sure to avoid any mods that might add to world gen other than the ruins mod. Edit: I just tested it with only vintagecraft and I keep getting that logspam and the huge filesizes. Thanks for the feedback, I'm now uploading v0.8.90 which should fix the error causing these log entries.Should be online today still! Yep, thanks for the quick fix! Log spam is now gone. Is it supposed to be reliably make sedimentary layers? If so it's not doing it for me. I've got my servers level-type set to VCDEFAULT. Also, I that it was supposed to override the basic vanilla behavior of wood and stone tools and force adherence to it's own concept of what that should be. No, Vintagecraft is also built to generate metamorphic or igneous rocks on the surface. What is enforce however is that sedimentary layers are never deeper than 20 blocks or so. A different method of creating your first tools might of course be changed in a future version. Does it work on Server too? Oceans will not be added in the near future. There are higher priority updates to be done first. Nevermind I figured it out! By the way,.. I figured out that Not Enough Items and VC don't work well togetgher! One thing,.. Did you think about making the worldgeneration optional like Biomes O Plenty,.. so people can choose to play a VintageC world, or something,... I have no idea if it is easy if all possible offcourse!! Right now it works for me, I have a seperate game profile with only the basic mods like NEI and Tree Capitator,.. the last one I have to see if I actually gonna need it becose so far it won't work anyway!! Keep up the good works man!!! What do you mean with optional worldgeneration? You mean using the world generator for Vanilla Minecraft? That exists already, search for "VintageTG" here on curse.